With 10 gorgeous lipstick shades in an all new packaging, these lipsticks will win your hearts yet again! 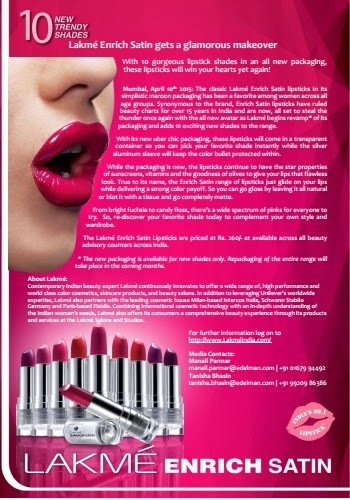 Mumbai, April 10th 2015: The classic Lakmé Enrich Satin lipsticks in its simplistic maroon packaging has been a favorite among women across all age groups. Synonymous to the brand, Enrich Satin lipsticks have ruled beauty charts for over 15 years in India and are now, all set to steal the thunder once again with the all new avatar as Lakmé begins revamp* of its packaging and adds 10 exciting new shades to the range. 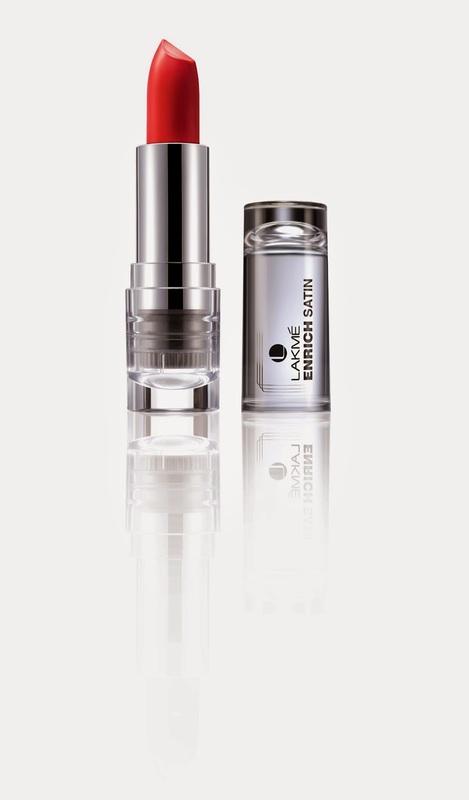 With its new uber chic packaging, these lipsticks will come in a transparent container so you can pick your favorite shade instantly while the silveraluminum sleeve will keep the color bullet protected within. While the packaging is new, the lipsticks continue to have the star properties of sunscreens, vitamins and the goodness of olives to give your lips that flawless look. True to its name, the Enrich Satin range of lipsticks just glide on your lips while delivering a strong color payoff. So you can go gloss by leaving it all natural or blot it with a tissue and go completely matte. From bright fuchsia to candy floss, there’s a wide spectrum of pinks for everyone to try. So, re-discover your favorite shade today to complement your own style and wardrobe. The Lakmé Enrich Satin Lipsticks are priced at Rs. 260/- at available across all beauty advisory counters across India. * The new packaging is available for new shades only. Repackaging of the entire range will take place in the coming months.